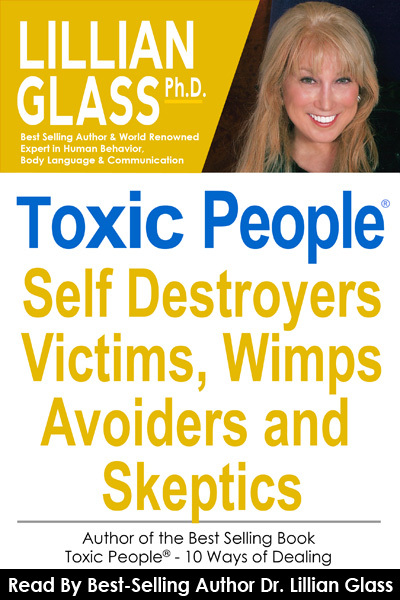 In Toxic People ®: Self Destroyers, Victims, Wimps, Avoiders and Skeptics, part of her TOXIC PEOPLE ® Audiotape series, Dr. Glass helps you identify and deal with deal with this specific following group of TOXIC PEOPLE. Read by Dr. Lillian Glass, world renown communication expert, Dr. Glass is the is the original author of the best-selling book since 1995 Toxic People. Through the popularity of this book she coined the phrase “toxic people” used in today’s vernacular. This group of people who make your life miserable,Self Destroyers, Victims, Wimps, Avoiders, and Skeptics can be a spouse, a parent, lover, sibling friend. boss, or co-worker or even people with whom you do business. They can make you feel inadequate, worthless, causing emotional and physical distress. Not only does Dr. Glass help you identify these specific group of Toxic People who may be in your life, she also provides 10 proven techniques for successfully dealing with them, including: Tension-Blowout, Unplugging, Direct Confrontation, Humor, Giving Them Love and Kindness,Mirroring and other techniques and how to use them. Dr. Glass shares theses specific techniques to use with the specific types of Toxic People®, People who make your life miserable. This book provides answers to the age old problem of how to deal with and heal from anyone who has caused havoc in your life and made it miserable.